Location : Himachal Pradesh Altitude: 1,220m. Kullu was once known as Kulanthpitha - 'the end of the habitable world'. Beyond rose the forbidding heights of the Greater Himalayas, and by the banks of the shining river Beas, lay the fabled 'Silver Valley'. Here is the core of an intricate web of numerous valleys - each of which is a visual delight and seems more beautiful than the other. The 'Silver Valley' has nature's treasures that lie carelessly scattered as flowers on the high meadows. This wealth nestles by every tree in the splendid forests, it bursts forth in the blooms and in the fruit of every orchard. The Kullu valley and, to a lesser extent, the Parbati valley, have always been a popular place to hang out and take in some mountain scenery. Recent tourist spillover from the political violence in Kashmir, however, has had a profound effect on the valley and Manali, in particular, has developed rapidly, threatening the valley's peaceful and unhurried atmosphere. The Kullu valley, about 80 kms long and often less then 2 kms wide, rises northward from Mandi at 760m to the Rohtang La at 3980m, the gateway to Lahaul and Spiti. 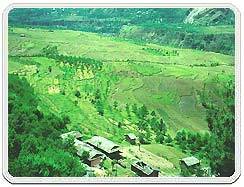 The Kullu and Parbati valleys, from Mandi to Manali, are serviced by the airport at Bhuntar, 10 kms south of Kullu town. 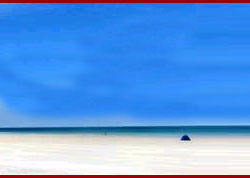 The high season is mid-April to mid-June, mid-September to early Noveber, Christmas and new year. Castle Hotel : It provides the best views, certainly the best atmosphere in the village and the food is pretty good. Poonam Restaurant : It has vegetarian food and a great location in the shadow of the Vishnu hotel. La Purezza Italian Restaurant : Situated in the village on the main road, at the start of the road up to the castle, serves authentic pasta dishes. Private airlines flies to/from Delhi and also links Bhuntar with Shimla. There are several buses to Shimla, Mandi and Delhi. The HPTDC runs daily buses in season to Dharamsala, Manali, Shimla, Delhi and Chandigarh. Kaisdhar (15 km) A high meadow fringed by deodar trees. A picturesque spot. Kasol (42 km) An open glade by the banks of the river Parvati. Clean white sand separates the lush green grass from the waters. A good spot for trout. Manikaran (45 km) At 1737 m, here are hot sulphur springs that bubble next to the icy waters of the Parvati river The place is revered by both Hindus and Sikhs. Treks from here lead to Pulga, Khirganga and Mantalai - a stretch of considerable natural beauty. The route finally revers the Pin Parvati Pass (4802 m) which opens into the Sutlej valley. Shoja (69 km) At 2692 m, this is a vantage point for a complete panorama of the Kullu area - snow peaks and valleys, meadows and forests, rivers and streams. Raison (13 km) By the banks of the Beas - and on the Kullu - Manali highway. Ideal for a taste of adventure. 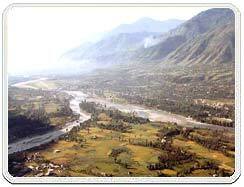 Naggar (23 km) For 1400 years this was the capital of Kullu. Its l6th century,stone and wood castle is now converted in a hotel .Here, a gallery houses the paintings of the Russian artist, Nicholas Roerich. Naggar also has three other old shrines. Adventure & Fishing : The Kullu Valley has numerous places for trout fishing. These include Katrain, Raison, Kasol and Naggar; then along the river Tirthan near Larji, in the Sainj Valley and in the Hurla khud. The valley is in the nucleus of several trek routes. Some major ones are over the Chanderkhani Pass to Malana over the Jalori Pass or Bashleo Pass to Shimta, and over the Pin Parvati Pass to Sarahan. The river Beas offers excellent opportunities for white water rafting. Festivals : When Dussehra celebrations come to an end in the rest of the country, they begin at Kullu. Over 600 local deities come to pay homage to Lord Raghunath. This is a time when the valley is at its colourful best. Climate Conditions : In winter the temperature gets quite low when heavy woollens are required. It is pleasant in summer and cottons are recommended. The Kullu valley has numerous places for trout fishing. These include Katrain, Raison, Kasol and Naggar, then along the river Tirthan near Lad, in the Sainj Valley and in the Hurla kund. The river Beas offers excellent opportunities for white water rafting . The valley is the nucleus of several trek routes. Some major ones are over the Chanderkhani Pass to Malana and Pin Parbati Pass to Sarahan. 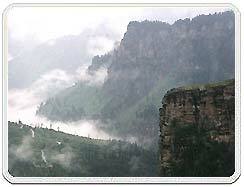 The Jalora Pass lies 5-km beyond Shoja and gives access to the outer Seraj region of the Kullu Valley. 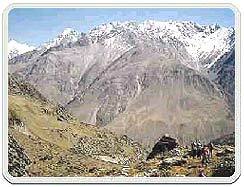 From Chamba to Udaipur (Lahaul) over Sach Pass, can be completed by trekkers within a day span of nine or ten days. In Kullu accommodation is plentiful and inexpensive with options varying from govenment and private hotels to guest houses and tourist lodges. Kullu shawls occupy a place of pride in handicrafts of the district. These exquisite specimens of art adorning the fair damsels of this fairyland, are popular among tourists as precious souvenirs. Other famous products of Kullu include caps, gadmas, rugs or'namdas', local tweeds, footwear or pullun', baskets and natural oils of almond and olive. The Himachal State weaving co-operative, Bhutti Weavers colony is 6 km south of Kullu, which has retail outlets, Bhuticco in many towns. There are also Govt. Handicrafts Emporium, Himachal Khadi Emporium and Khadi Gramudyog. Air : The airport at Bhuntar is 10-km from Kullu, where taxis and buses are available. Rail : The closest narrow gauge railhead is at Jogindernagar, 95-km from Kullu. Road : By road, the distance from Delhi via Mandi is 530-km and from Shimla this is 240-km. From Delhi and Shimla , luxury buses ply to Kullu. There's a bus and taxi stand on the opposite side of maidan. The main bus stand is by river in the northern area of the town.